Jameson 18 year-old Limited Reserve. Sorry for the late post. Weekends do go by way too fast, and as it’s a holiday here, I’ve been running some errands. While doing a search through my posts I realized I have yet to write about Jameson, so for this post I am going to stick with the Irish whiskey theme for another week and write about Jameson 18 year-old Limited Reserve. I have no doubt that Jameson is an Irish whiskey everyone has heard about even non-whiskey drinkers. Jameson is triple distilled and John Jameson established the distillery in 1780 in Dublin, Ireland. 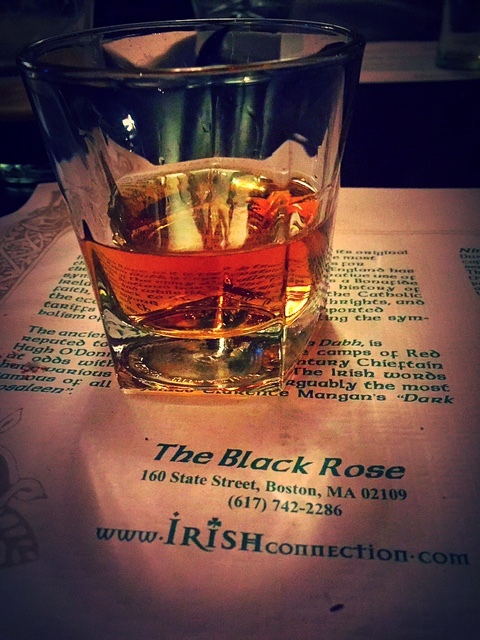 It was the first Irish whiskey I ever tried, however it was only a couple weeks ago that I first sampled the 18 year-old while out with friends at The Black Rose here in Boston. I found this 18 year-old to be very smooth and fairly priced around $100-$110 for an 18 year-old product. I like the whiskey; the thing is that it didn’t blow me away. It is a complex whiskey but, for an 18 year-old whiskey I expected a lot more. Don’t get me wrong, it is a perfectly good dram that I wouldn’t turn down if someone offered me a glass, I just would not run out to buy it. If you are a Jameson fan and have not tried this one then I do suggest you try it, as I think it is a whiskey you might enjoy. Sometimes a whiskey doesn’t have to blow you away for you to enjoy it. Being a perfectly good dram is certainly OK.